The human body is an amazing instrument from an engineering standpoint. Replicating just one part of it proves extremely difficult but these athletic legs show a lot of promise. This is the work of a Japanese researcher named [Ryuma Niiyama]. 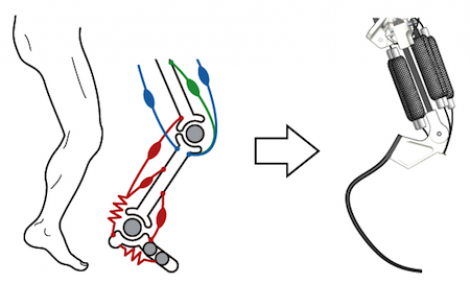 He’s been working on the design for years, and is now using pneumatic actuators to mimic the muscles in a human leg. The lower portion of the leg uses a spring mechanism that resembles some running prosthetics currently in use. These serve as a spring to store energy and reuse it by bouncing against the ground. He’s trying to teach his robot to use these legs; taking it through a learning process necessary to use the thigh actuators for locomotion and balance. We were surprised at how life-like the motion in the video after the break is. Even when falling down the movements are very life-like. We thought the movements of Little Dog were real enough to be creepy, and this robot may be close enough to our own mannerisms to fall into the uncanny valley. Looks like he’s using air muscles as seen in other projects. I made a pair of these muscles out of silicon tubing and vinyl sheathing. I was impressed with how strong and resilient they are. The downside is controlling them. The most affordable solution I found was 2x $9 solenoid valves for controlling inflation and venting of each muscle. We got a pair of the muscles working but it was rather obvious that the bulk of all valves would make the robot we were building either way too big or way too expensive. It was a great learning experience though. I think that the diagram is going to give me nightmares remembering system dynamics. hmmm… This learning (and mostly failing to go past 10 meters) reminds me of that QWOP game. I wish they’d stop claiming ‘progress’ until they get a robot that can stand up on its own. There is nothing indicating progress about yet another robot that falls flat on its face after 3-5 steps. why can’t we make balanced robot legs? Give it some arms, they really help with balance. Or a tail, tails allow you to balance really well. Although that could lead to robo-raptors, mebby I shouldn’t have suggest a tail….. Reminds me of the feet attachments from Portal. well, it was just an awkward fact in nature to have a strange being walking (so good) on 2 (thin) legs. and i can hardly imagine the number of neural connections activated to walk on mountain rocks. as it is from ‘falling’. I winced when the torso fell, and was actually thinking ‘ow, that’s hard on the kneecaps.’. Empathy is often not your friend. I’d have to agree with M4CGYV3R. Agreed…they have not floored me with the progress made…unless the creepy little robot thing had been DRINKING and that was a stumbling drunk SIM…then it rocked. Weapons? I guess we’re just that different cause my first thought was “arms and head”. Followed by “service robots helping the elderly”. But i guess a few miniguns and a flamethrower would be interesting too. the movement look like a real human leg!!! Give it feet, the human foot isnt just a nub for walking on, it helps balance us by using the muscles in it, sure humans can walk without the aid of the foot but it makes it a LOT easier.